Motion waste refers to the extra physical steps taken by employees and equipment to accommodate inefficient process layout, defects, reprocessing, overproduction or excess inventory. Additional and unnecessary motion takes time and adds no value to the product or service. Moving and adding value is called work. Moving and not adding value is adding costs to your company and is motion waste. IntelliFinishing removes motion waste simply by its technology and design. We know we cost more than an average Power and Free system. We are okay with that, because we know the value our completely automated finishing system adds to our customer’s production processes and profit margins. When we are designing systems, we look for ways to share operators and resources between stations. In one system, we were able to position the mask and unmask stations next to each other, allowing for one person to perform both tasks. Frequently, the same resources may be used for loading and unloading since the system can stop in a zone without affecting other areas. Operating stations track each carrier within each zone allowing you to quickly identify any issues and exactly where it is located, saving time and money in motion waste. Work instructions may also be displayed at stations and are useful for masking and labeling instructions. IntelliFinishing complete paint systems give you the ability to move at variable speeds within zones, along with the value added option to stop the line within a zone or process without affecting the rest of the line, eliminating unnecessary movement of equipment. With less overall movement by workers and equipment, the chance of injury decreases. Have you ever wondered how beneficial decreased movement can be to your bottom-line? For example, the average back injury (sprain/strain) can cost more than $10,000 in direct costs (National Safety Council Statistics) and anywhere from $30,000 up to $100,000 in indirect cost. The direct cost for all U.S. workers out of work due to Musculoskeletal Disorders or MSDs is estimated at $13-20 billion annually with indirect costs between $26-110 billion annually. Transportation Waste is defined as the unnecessary movement of people or parts between processes. Automated conveyors are usually not the first thing lean coordinators for manufacturing think of when they are developing a Lean strategy, but it can have a huge effect on Continuous Improvement. I hope lean organizers (in any production facility which processes finished parts) consider the following information when beginning their lean journey. Lean conveyance in manufacturing paint processes is more than moving parts from one place to another; it’s about eliminating unproductive waiting time by delivering parts to meet customer or station demand. An IntelliFinishing complete finishing system is responsive to Lean manufacturing, focusing on optimizing product flow throughout the finishing process. At IntelliFinishing, our unique Complete Powder Coating or Complete Liquid Coating System has the ability to compliment your Lean Manufacturing processes and eliminate waste in your facility, adding value to your products and your productivity measurements. When thinking of an automated paint system, I hope you compare the benefits of all the types of conveyor systems available to you. See how an Intellifinishing system stacks up against monorail and power and free. Of course, I want you to choose our IntelliFinishing system if it is the best fit for your needs. 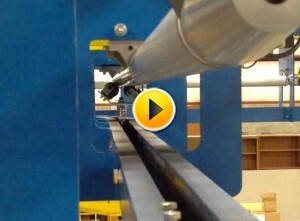 Each conveyor has value for the processes in a manufacturer’s finishing system. The value added to your particular Lean expectation is dependent on what your requirements and end goals are. If you are looking to cut transportation waste, an IntelliFinishing automated paint system may be what you are looking for. Here are some of the areas where you could be rolling “snake eyes” with every toss of the dice, (when you start up your production line for the workday), with an IntelliFinishing System. The IntelliFinishing system has immediate response when adjusting to process changes and production flow providing continuous improvement in your finishing process. It can even be extended to point of use, allowing your parts to travel from paint to assembly to shipping, improving your workflow. Our lean paint system allows for pre-programmed recipes that let you change process speeds and dwell times specific to the part and part family. Several of our customers have added additional phases after their systems were installed, and efficiencies were recognized. Second and Third phases were implemented when necessary, instead of over-investing in the beginning. We equate this as “jackpot” for our customers! Carriers can stop and start in a process without affecting the rest of the line. An IntelliFinishing complete finishing system for manufacturers can attain single piece flow because it uses recipes to produce consistent and repeatable results. Our systems also have less than 1% downtime meaning you will be able to set and meet your required takt times. Imagine a conveyor system that has a footprint that equates to one mile in length, filled to capacity with parts for the paint process (you are playing with a full deck!). Now imagine that somewhere within one of the zones there is a chain jam. If you work in production you probably have the ability to pinpoint exactly how long it takes to shut down production, find your pry-bar or heavy duty come-along (or whatever tool you have in place) to release the jam and physically pull the carrier in reverse to a buffer zone; perform the required maintenance; inspect the chain links as stated in your maintenance manual; all before you can restart production. As we have seen in plants, sometimes the jam fixes itself once the torque releases and operators will spray paint the section where the jam occurs and wait for that section to pass through the platform to inspect the chain for damage. Think about how many people on the paint line this affects and add in the costs of their downtime. “You got to know when to hold ‘em and know when to fold ‘em”. If this is something that happens frequently, you need to get more information about IntelliFinishing Automated Finishing Systems as soon as possible. Our alternative to power and free conveyor has no chain. Reduce your maintenance, your floor space and downtime. Return chain is a huge waste taking up valuable floor space. It can be a nightmare when troubleshooting. An IntelliFinishing Turnkey Finishing System’s unique “wild card” feature, is the ability to travel in forward AND REVERSE with no wasted movement such as a return chain that is empty having to travel through the whole footprint to get back to its original starting point. An IntelliFinishing system uses deadhead turns and spurs if parts need to be re-routed or receive extra processing. Or what we like to refer to as the “Royal Flush”. No chain. No jams. No operators waiting for production to restart. No de-dogging. Less maintenance. An IntelliFinishing System gives you the ability to incorporate your work stations where you need them for your product flow. Masked parts can be unmasked at workstations located together for point of use in the production process to continue on their way immediately. You are in control to develop your personal lean strategy and what design works best for you when you “lay your bets on the table” with an IntelliFinishing design. We can create a Lean layout for your finishing system that incorporates point of use into your production process. Click to enlarge. Our IntelliFinishing system, used by top manufacturers, offers your production line the ability to save on everyday wear and tear, plus maintenance costs, by not continuously running. If a part, or trolley is not present in a zone, the conveyor doesn’t run. We’re serious about saving companies as much as we can, unlike those other “jokers”. IntelliFinishing “ups the ante” when you require a system that WILL fit into your available space, and we have proven it. One of our customer’s was told there was NO way they could fit an automated finishing system into the small space they had available. Our IntelliFinishing complete finishing system was designed just for that space, installed into that space and has been producing finished parts for more than two years! We have decreased floor space requirements by up to 43% in some instances (this was a large system install). The use of shuttles and deadhead turns eliminates the need for large radius turns in your conveyor system, again resulting in reduced floor space. Our unique shuttle negates the need for huge turns to accommodate large part maneuverability and allows for easy expansion with no production downtime when you are ready to expand. We are “all in” when it comes to helping our customers save time, money and manpower when choosing a finishing system. Shuttle and deadhead turns eliminate large radius turns resulting in reduced floor space usage. Do you love your paint system? 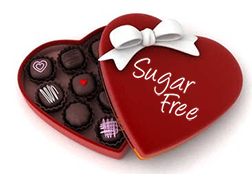 An IntelliFinishing complete paint system is more “LEAN” than a box of “sugar-free” chocolates. Many manufacturers are implementing lean manufacturing practices into their workplaces and are gaining an advantage over their counterparts in the industry. Although traditional fixed conveyor systems have been one of the leading factors in lean management over the last two decades, they have lost their luster—not just to those who control the purse strings, but also for engineers who have long dealt with the headaches of inflexible systems, long lead times and production shutdowns while the systems are installed. Having a lean finishing system just makes sense. In traditional systems, processes are dependent on the processes of the others. If a part needs more time in the oven, washer or another process, and you slow down the conveyor to change the process time, then you may experience a reduction in production throughput, create quality issues, increase labor costs (operators waiting for parts) and inventory issues. We consider our IntelliFinishing automated paint system to be lean because it eliminates these issues. It’s modular and highly customizable. Our finishing system’s conveyor is a bolted together, floor-supported system with friction-driven trolleys on a rotating tube instead of a chain. No return chain dramatically decreases floor space usage. 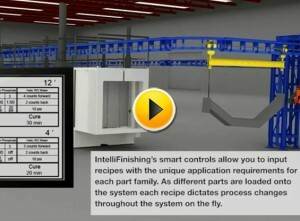 An IntelliFinishing system easily expands and adapts to changes in your process or production. Plus each customer has the option to design specifically for their requirements. This system optimizes workflow through the unique movement capabilities of the conveyor, load accumulation and effective sequencing for highly variable processing in areas such as drying or curing. Each part recipe is different and may require a different cure time. It is one of only a few systems that can deliver parts in a desired different sequence than the way parts were loaded. You can also expand your system to point of use, e.g. assembly. Built-in control technology can change the destination of products, set up in-line speed changes or stop carriers for processing without stopping production. No more slow zones or wasted time. The controls of an IntelliFinishing complete finishing system recognize specific part recipes, tracking and adjusting for variations in components and processes. Integration with your ERP system provides an even smoother responsiveness to your production schedule. If you are in the market for a lean paint system, check out our videos and contact us today! Are you new to the industrial coatings industry, or want to learn more about Lean Manufacturing and how it can be applied to your manufacturing process? Join us at the third annual Midwest Coatings Seminar on August 8th to network with other manufacturers and suppliers in the area, learn about how to implement lean, and see a live demonstration of IntelliFinishing’s new spinning tube conveyor technology. This year’s presenters include Brad Muir and Gary Conner of Technical Change Associates who will be discussing Lean as a growth strategy. Experts in the field with over 40 years of experience, Brad and Gary will cover the tools and techniques to successfully implement lean into your manufacturing and finishing processes. Following this interactive presentation, you will have two options. Option 2 – Improve Production Line Gaps, presented by David Underhill of IntelliFinishing. Learn how production line gaps can be improved or eliminated with the right conveyor and controls. David has over 30 years of experience in the finishing and conveyor industry and will touch on topics of inventory problems, reduced production throughput, and other negative effects of production line gaps. Option 1 – Improve Communication by Removing Waste presented by Dan Stutterheim, CEO of Kasa Companies: Lean. In manufacturing, it means reducing waste, specifying value from your customer’s perspective, and allowing it to flow. Can you apply these Lean Principles to the way your organization communicates? Absolutely. Long emails will be reduced to sentences. You can communicate your vision, your plan, and your instructions in a way that everyone understands the message and acts upon it appropriately. Reducing waste in communication is based upon learning the six personality types and a new concept of communicating called the Process Communication Model (PCM)®. Applying these concepts will lead toward a trusting and efficient workplace where everybody understands the intent of your message and acts upon it appropriately. If you are able to stick around for dinner, IntelliFinishing will host a BBQ at their main facility just a few blocks from the seminar. The informal dinner is a great opportunity to visit with other attendees or ask the presenters in depth questions relating to your specific situation. To learn more, register for the event, or view the schedule, point your browser to www.leanfinishing.com. Ever wish you had a different finishing line for every type of part you have to paint or powder coat? Large heavy parts take more time to process than small thin ones. Some parts require additional masking and others don’t. Different chemistry is required for different types of metals… the list seems to be endless. IntelliFinishing has presented to a variety of audiences recently and manufacturers are impressed with the “Plan for Every Part©” technology. Each item you process gets the best finish available, just like the system was built specifically for that part. Unlike traditional finishing systems where the system is built for your longest or heaviest part, which results in over-baking of other parts; the IntelliFinishing finishing system provides capabilities that are unmatched in the finishing industry. With conveyors that move load bars of parts at varying speeds which are based on the parts’ unique size and material, an IntelliFinishing system offers capabilities in ONE LINE that would take MULTIPLE LINES for traditional systems. Customers have been amazed at what can be accomplished with layouts that are not limited by a one-way, one-speed conveyor. The IntelliFinishing system is not for everyone. Do you finish a variety of sizes of parts? Do you finish parts that are made from different materials? Do your processes for finishing ever change? If you answered YES to any of the above questions, then you may want to see how an IntelliFinishing system is rocking the world of finishing. Contact us at info@intellifinishing.com. © 2015 Kasa Companies. All rights reserved.